I took the week off from hoof boots, Easyboot testing, gaiters and larger size boot requests. I love my job but family and spending time with my daughter trump horse boots every time. Easyboot Edge, Easyboot Glove and Easyboot Rx hit Switzerland. On Friday 1/22, I had the opportunity to visit Zurich, Switzerland and EasyCare distributor HoofGroove. The quick visit contained a several hour boot fitting demo, business discussions and dinner. Sibyle’s horse Jack was an awesome demo horse and was fitted in all the new EasyCare hoof boots. HoofGroove was very impressed with the new designs and pleaded with me to leave as many samples as possible. Expect EasyCare’s new line to hit Switzerland mid February. Jack stood with us for roughly an hour without halter and without being tied. Pretty cool. Several months ago Claudia and Bernd Jung of HufShop asked if EasyCare would be interested in attending a Hufshop partner conference. The theme and purpose would be to build better partnerships and communication between Hufshop, Hufshop dealers, Hufshop consumers and EasyCare. My answer to Hufshop was “absolutely”. My internal thoughts were “heck yes” and “I wish all our international distributors took the same initiative”. After a quick visit to Zurich with Hoofgroove, I headed to Frankfurt then jumped over to Murrhardt. The conference started Saturday mid-day and was attended by 30+ Hufshop dealers and practitioners. Dialog and conversation flowed quickly and well despite language barriers. I was immediately impressed by the attendee’s knowledge of barefoot horses, hoof boots and market conditions. I personally learned a great deal about the challenges of keeping a horse barefoot in the wetter German environment. We spent the afternoon talking about the history of Hufshop, direction of Hufshop, EasyCare/Hufshop partnership and partnerships between Hufshop and dealers. Conversations were positive as everyone discussed how these increased partnership opportunities in the end help horses! We ended the night with a great Italian dinner and drinks. Conversation about horses, barefoot trimming, hoof boots, the economy, and fuel prices continued well past mid night. New friendships were established, knowledge grew in many areas and partnerships increased. I want to personally thank Hufshop and everyone who attended. Great group of people and a wonderful weekend. Thank you Germany. Check out more about the weekend at the Hufshop Blog. Several EasyCare team members are heading to BETA in a couple days and will get the opportunity to spend time with our international distributors and specifically our UK distributors. EasyCare uses two distributors in the UK. 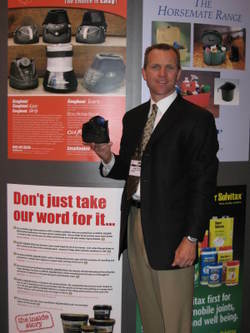 Battle, Hayward and Bower (Battles) distributes the Easyboot, Boa and EasySoaker hoof boot ranges. New Equine distributes the Old Mac's range. I have personally attended BETA for the last four years and each year have helped Battles in their stand. This year we will have our own stand and intend to do more product education and drive business to both Battles and New Equine. Stop by and see us in stand J-1-2 and take a look at the new Easyboot Edge and the complete EasyCare hoof boot range. 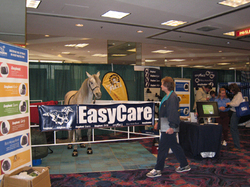 EasyCare's on the Road Again!!! 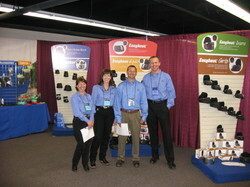 Some of the EasyCare staff will be hitting the road for some upcoming shows and rides. Click here to see our event schedule. If we happen to be traveling to your neck of the woods or you happen to be at the same event be sure to stop by and visit. We'd love to see you! We’ve still got events coming up so, come and check us out. Click here to see where we’ll be next! See ya on the road! 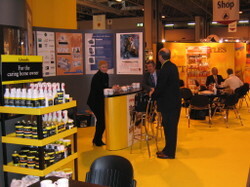 I'm off to support Battle Hayward and Bower at the BETA International Trade show in Birmingham England. Battles continues to do an outstanding job with the EasyCare Hoof Boot product range in the UK. If you're at the show stop by the Battles booth # G-2-1 and say hello. 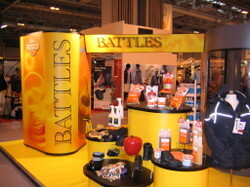 Here are a couple photos of the beautiful stand put up by Battles.